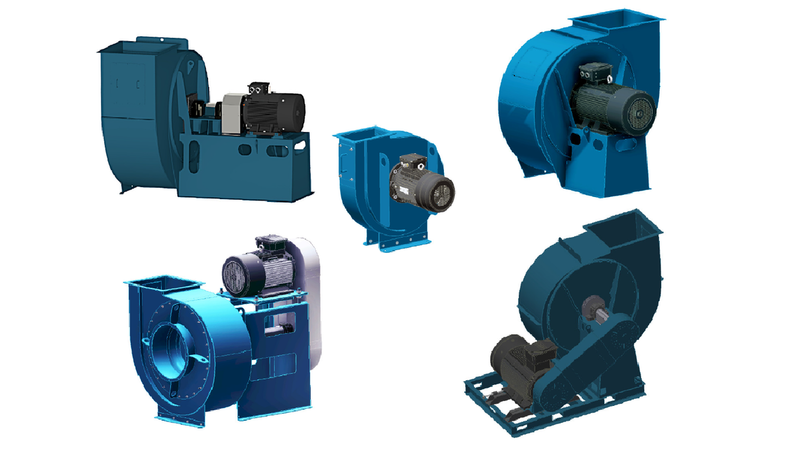 The Combifab range of highly efficient, quiet running radial fans include three dedicated impeller designs for handling clean air (R type), air containing dust and waste material (S type) and for transporting high concentrations wood dust and chips (T type). Versatile drives, including energy saving inverter drives ensure the fans are matched exactly to the required duty with minimum environmental effect. The Combifab Series of fans are heavy duty centrifugal fans with three different fan wheel designs and four housing and drive configurations to meet the application requirements. Nederman stocks a large inventory of fans for immediate delivery so please call to check availability. Also, we carry used inventory for those on a budget. When it is time to replace an existing fan or install a new system, a more efficient solution for the fan design may be a direct driven configuration with a Variable Frequency Drive - VFD on the fan motor in lieu of a belt driven configuration. Belt drive fans require 2-5% more energy than a Direct Drive and VFD arrangement. Furthermore, with this type of configuration, the fan performance can be modified manually through the VFD control interface and a PID Control Loop. Autogates can be installed to minimize energy consumption.